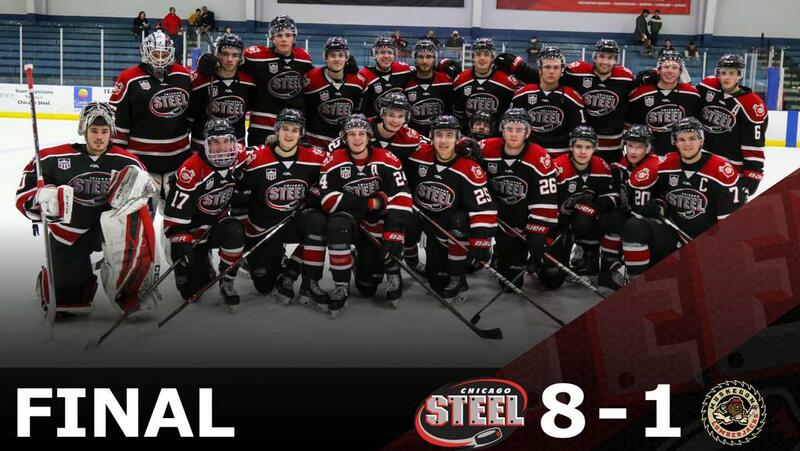 MUSKEGON, MICHIGAN — The Chicago Steel closed the regular season with a complete team effort in an 8-1 win over the Muskegon Lumberjacks Saturday night at L.C. Walker Arena. Chicago (37-21-4-0, 78 pts.) clinched the #2 seed in the Eastern Conference and a First Round bye with the win over Muskegon (41-17-3-1, 86 pts.). Chicago’s attempt for a second Clark Cup Championship will begin in the Eastern Conference Semifinals with Game 1 and Game 2 scheduled for Saturday, April 20 at 7:05 p.m. and Sunday, April 21 at 5:05 p.m. both at Fox Valley Ice Arena. The Steel will also host Game 5, if necessary, on Saturday, April 27 at 7:05 p.m. The Steel entered the game needing only to avoid a regulation loss to lock up the second seed. Steel defenseman Luke Reid gave the team a jolt early, striking for his second goal of the season to open the scoring 3:51 into the game. The University of North Dakota prospect fired home a perfect setup pass from left wing Josiah Slavin with a heavy slap shot from the blue line that beat Muskegon goaltender Ryan McInchak on the blocker side. Muskegon leveled the score less than three minutes later when forward Bobby Lynch stripped the puck from a Chicago skater at the Steel blue line, skated in and lifted a backhanded shot over the glove of Chicago netminder Reilly Herbst. That was the last time the game was in doubt. Chicago answered back with 7:06 to play in the opening period when center Cole Quisenberry deposited his 11th goal of the season. The play started in the neutral zone where Steel right wing Matthew Samoskevich chipped the puck in and fellow University of Michigan commit Josh Groll settled it and found Samoskevich at the goal line. From there, Samoskevich connected with Quisenberry at the front of the net for the patient shot around a sprawling McInchak for the 2-1 Chicago lead. Center Adam Robbins extended the lead to 3-1 just 39 seconds into the second period as he cleaned up a rebound in the slot for his 11th goal of the season. Defenseman Jimmy Dowd created the rebound with a point shot and collected his third assist of the weekend after he received a pass along the boards from right wing Mathieu De St. Phalle. Steel rookie defenseman Owen Power picked up his 11th goal of the season – fourth among USHL defensemen – when he circled the net and calmly fired a wrist shot over the glove of McInchak. Steel center Nick Abruzzese collected his 51st assist of the season on the play, setting a franchise record for most assists in a single season. Abruzzese made it a 5-1 game on the team’s first penalty shot of the season after he was taken down on a breakaway. The Harvard University commit snuck a shot through the five-hole. Chicago added a pair of goals in a 16-second span after Muskegon was called for matching minors, giving the Steel a 5-on-3 powerplay. Abruzzese (2-1-3) scored his 28th goal of the season at the end of a tic-tac-toe passing play for his USHL-leading 80th point of the season to start the scoring. De St. Phalle then scored a goal of his own moments later to extend the lead to 7-1. Quisenberry collected his second goal of the game midway through the final frame of the regular season as he went bardown for his second multi-goal game of the season. The full series schedule for the Eastern Conference Semifinals will be released once the Steel’s opponent is determined following the First Round series. Chicago will play the top remaining seed (either Youngstown, Cedar Rapids or Team USA), while number one seed Muskegon will play the lowest remaining seed.